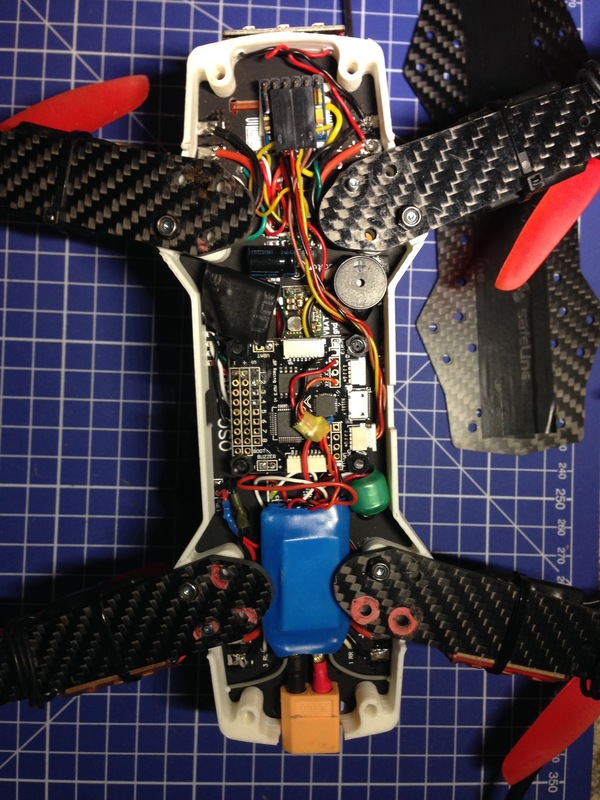 Konrad shares his experience on how to save space in a mini quad tight build by lowering the FC/PDB stack as much as possible. Separate PDB from carbon with a single washer and use nylon nuts and more washers to add space between FC and PDB. After assembly, cut the screw to length if needed. That’s a 12mm screw, bottom plate is 2.5mm, entire stack height is only 9.5 mm! Here I used a simple, low profile PDB – that gave me over 10mm of free space for other components above the stack. You can see the entire build log here. In case when You need to use metal screws in FC holes – for example when You have an X frame that uses them as structural support or just have a tall PDB, use the smallest spacer You have. If Your PDB has flat bottom, You can mount it upside down – that saves some height as PDB components are then located between spacers. If Your FC of choice also has a no components on the bottom, then a washer between it and the PDB is enough. Use two if You need more airflow. Bottom FC spacers are 8mm. Stack is about 16mm tall. I have checked other PDBs as well – there are a lot PDB’s with flat bottom to choose from. In both methods, always check for shorts – if FC solder blobs don’t touch the PDB or PDB blobs are not shorting on the frame. Another good idea is to make sure you don’t cut he wires too short, leave some room in case you need to take the FC out. I found by routing all the wires from one side of the board would prevent this. If you want to achieve the absolute minimum wiring, I normally would desolder all the ESC wires (both power and signal) and solder them on to the PDB and FC first. Then you can close the stack, shorten power and signal wires as needed, and solder them back to the ESC’s. Some really good soldering skills might be required. Hope that saves some trouble fitting components on your next, tight build. Cheers! If you like this article please subscribe to his youtube channel. What about electric noise from FC perspective ? isn’t it important to keep fc a little bit far from PDB? Hi, great post. I like the Matek Power Hub V2.1 PDB. You have put the ESC power wires across the PDB, all soldering pads are in the right position. Much cleaner build, love it. Some good ideas and points. Thanks. I started stacking a de pinned X4R, PDB on top then fc on top of everything. I can gain some more space using your ideas and can probably fit the vtx on top of the sandwich.